Yesterday’s (Sun. March 31, 2019) ONE Championship: A New Era event featured some tremendous fights in Japan. In the co-main event of the night, ONE atomweight champion Angela Lee jumped up to strawweight to challenge Xiong Jingnan. Lee went into the fight undefeated in her mixed martial arts (MMA) career. However, that all changed against Jingnan. “Sometimes we don’t get what we want. Even on our best days we can face defeat. But there’s always tomorrow after we have done our best today.” This is just one of the many messages that I woke up to today and I want to thank you all so much, for your love & support. This message was sent to me from my Grandma and it really touched me. “If life is a series of challenges and lessons, then this is definitely one of them. I’m sorry I couldn’t accomplish my goal last night. I put it all on the line and gave it all I had in that 4th round, trying to finish her with the triangle/armbar. When it came to the 5th round, I just didn’t have anything left in the tank. “No excuses. 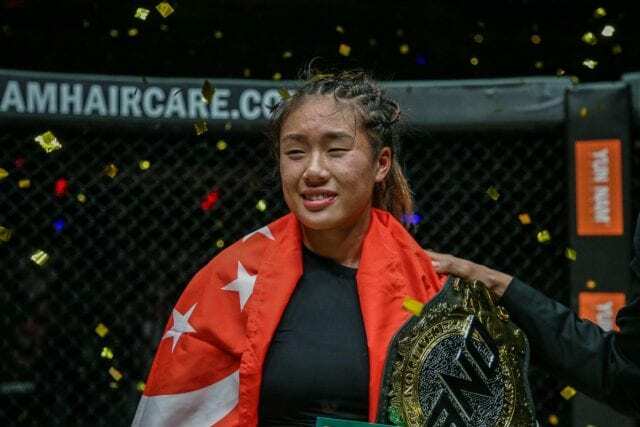 Even though things didn’t go as planned, I would like to thank Chatri Sityodtong @yodchatri for giving me this opportunity to fight for a second division world title. It was also an honour to fight on a massive event like #ANEWERA. “Thank you to all the people I work with in @onechampionship who are there with a handshake or a hug regardless of the outcome. Thank you to everyone who was supporting me, I love you all. Japan, you are amazing and I hope to come back to this beautiful country and fight again.